Without realizing it, I seem to have branched into collecting unusual keys, away from the ubiquitous Bunnell ‘Triumph’ / J38 style key. Back in the post Civil War “Reconstruction” period before the turn of the century, the race was on to ‘build a better mouse trap’ that is the Telegraph Straight Key. Many designs and patents popped up during this time. The major flaw each designer was trying to overcome was the trend for brass trunions from becoming loose in a brass key lever after extensive use. Bunnell’s now famous 1881 patent which produced a one piece steel lever which included trunion mounting points essentially eliminated this issue. That design was copied and has proven to be THE favored design used on straight keys from the 1880s through today. The Tillotson ‘Victor’ designed key highlighted on this page is an example of one of the other design attempts to get around the trunion issue. As you can see, it uses a knife edge arrangement between the lever and posts. I believe the spring to not be original to the key. Regardless, it has a great feel on the air. After Tillotson’s death in 1885, the company re-organized as ‘E.S. Greeley & Co’. This key has the inscription “E.S. Greeley & Co. successors to L.G. Tillotson & Co”, denoting a slightly later date, around 1887. The key sits on a home made KOB made of three layers of paneling with green felt on the bottom. The wiring between the key and sounder is embedded between the layers making for a very clean installation. Since I can’t get to the wiring, I’ve added the white striped wire to short out the sounder to use this key on the air. To view more detailed pictures of this E.S. 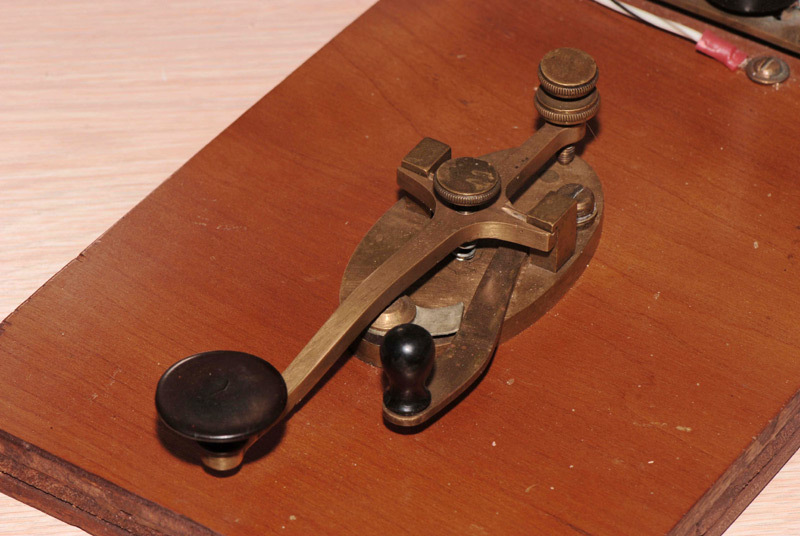 Greeley ‘Victor’ telegraph key, CLICK HERE.